B2596LF is rated 4.5 out of 5 by 78. Rated 5 out of 5 by Phil from Great shower My old shower had plastic fittings and kept cracking, this one has brass connections and seem to be much better made. I also like the sprayers settings and much improved hose. Rated 4 out of 5 by Lachman from Low water flow pressure:Good looks The water flow pressure is low for some reason! The regular faucet spout faucet Model # 2521 that we had before had a much stronger water flow. 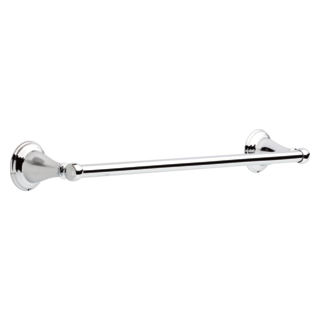 Rated 5 out of 5 by RBK2018 from Great finish, Great finish, height and handles are easy to turn on and off. Easy install. 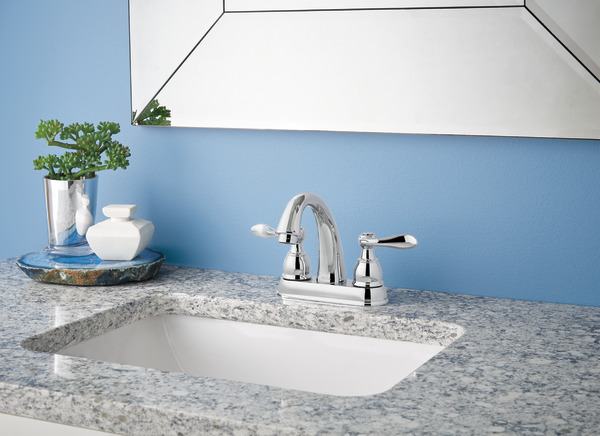 Rated 5 out of 5 by Pierre from Classic looks These stainless steel faucets really look great on our new countertop. Plan to use rest of collection in our bathroom remodel. Rated 5 out of 5 by penny pincher from Old faucet needed replaced. Contractor informed me It is beautiful, adds class to the bath, easy function and cleaning. Rated 5 out of 5 by Kathi10 from Works great - Nice finish Came with the house purchase. 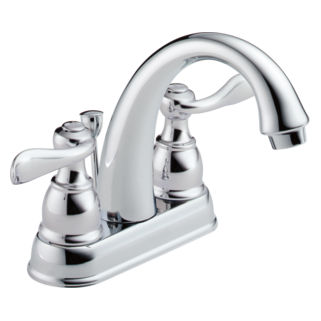 Had a little problem with a drip and Delta sent the replacement parts and it was easy to fix - now it's back to normal - Nice looking faucet and there are 4 in my house. Wouldn't hesitate to purchase if needed. Rated 5 out of 5 by Chris from Love it I really love all delta products and this is no different. I opt to get the metal pop up because of the problems I have with other brands plastic. Rated 1 out of 5 by Nik from Don't vaste your time and money. Very pour prudect. Some of your bathroom faucets recommend a 2 1/2&quot; min. clearance from the backsplash to the centerline of the sink holes. I have 2 1/4&quot;. Will I still be able to install the faucet? Is the aerator removable on this faucet and if so what size is it? 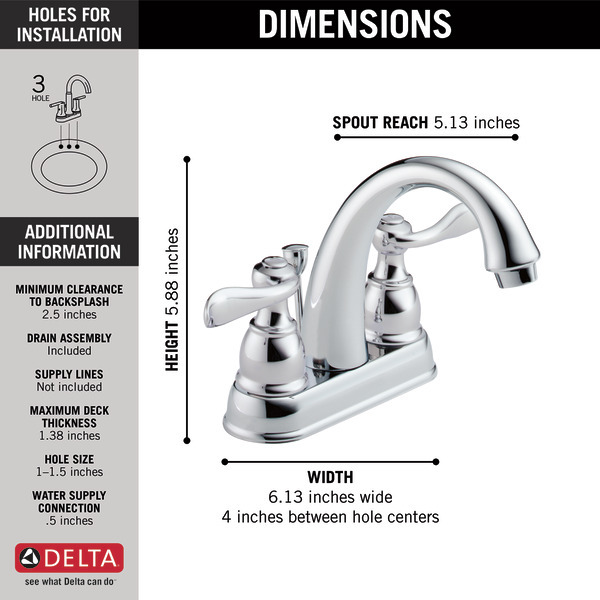 We have a laundry quick connect that would need to replace the aerator and it is hard to tell if this would work with this faucet. Thank you for your question. 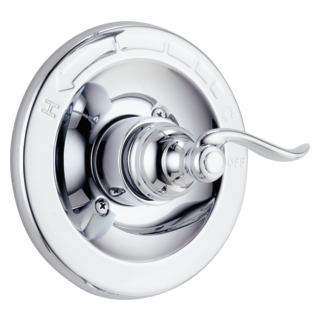 Delta Faucet model # B2596LF has a 15/16&quot; aerator. You will need to check with the manufacturer of your laundry quick connect to see if the threads will match with this. What is the difference between models B2596LF-OB and 25996LF-OB? Hello EGentry, Thanks for your question! The 25996LF-OB is exclusively sold at Lowes while the B2596LF-OB is available from any retailer that carries our products. Other than that, the faucets are the same. I hope this helps! What are the supply line materials made of? The building handy man told me not to get plastic supply line since we live in a 42-story high-rise and the water pressure is strong. Is there anyway to restrict water flow to this faucet? My faucet already has the aerator that comes with the product but I was wanting to restrict the water flow even more. My kids forgetting to shut off the water when brushing their teeth (and other factors) have caused high water bills and I am wanting to conserve water every way I can.